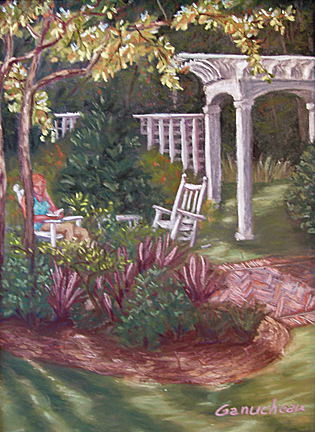 Pastel pleine-aire painting of a garden in Demarest Landing, painted during the New Hanover Arboretum's Art in the Garden Tour in Wilmington, NC by Rose Ganucheau. I painted this during the Art in the Garden fundraiser. I loved the way the landscaper combined the native North Carolina trees with landscape specimen in a gorgeous variety of colors and textures. An inviting place for a lazy afternoon.